I have a 50-year-old client with hard, brittle nails with recurring ingrown nails. Can I help prevent the ingrown nails? I have a 50-year-old client who has been having recurring ingrown nails on her fingers. It tends to affect the middle and ring fingers on both hands, and on both sides of the nail. She starts to feel sensitivity to pressure on her fingers and within days you can see pus under the skin. It looks like a small piece of nail is growing into the skin, causing the infection (and quite a bit of pain). She has hard, brittle nails that she wears short and polished. Is there anything I can do in the salon to prevent this from happening so often? When I see someone present with recurrent minor infections like this, I take a look at the whole picture. I do have the advantage of having access to patient medical records, but as a licensed professional you are able to question the general health of your client. 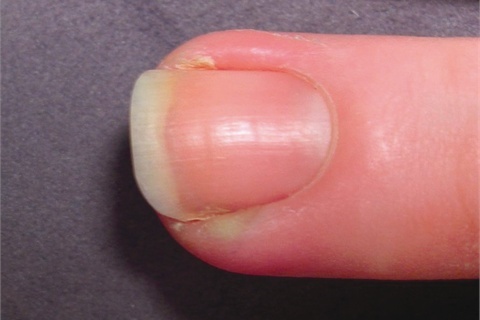 Since this client is 50 years old, there is most likely another co-condition underlying the recurrent infections. I would first ask her gently if she is a diabetic, or has been told by a physician that she is in a pre-diabetic state. Second, I would ask her if she has taken any immunosuppressant (chemo) drug therapy recently or currently. If the answer to either of these questions is yes, then I would refer her to her physician. Third, I would ask her if there is anything in her health history that would shed light on this situation. If the answer is no, then I would advise a regime of careful hand-washing with a soft nail brush and gentle castile soap. Her preference for short polished nails is a plus, as she would not be a good candidate for enhancements. Careful adherence to a hand-washing routine should keep her nails clean and prevent recurrent infections. If she still continues to have a painful, purulent (pus filled) cuticle area, then I would refer her to her physician, as you have done all you could within the scope of our profession. — Grace Almleaf, MNT, is a podiatry assistant in Jamestown, N.Y.